I’d been wanting to visit Piel Island for at least two years, ever since I’d glimpsed the stark, imposing ruin of its castle from the shores of nearby Walney. I remember going on about a two hour wild goose chase at the time, frantically trying to locate this eerily romantic half-structure so that I could photograph it at close quarters in the near-perfect light, before I finally abandoned my inherent maleness and sheepishly resorted to the road atlas in the boot. Oh, so all I had to do was drive round to Rampside and proceed along the causeway at Roa Island, and Piel was just a hop, skip and a jump away by ferry. Easy peasy! Except the ferry wasn’t running, and nobody really had a clue as to when it might be. From that moment, I knew that one day I just had to visit the island itself and explore those curiously inviting shores. It was a trip that proved to be more elusive than I would’ve liked, but I finally had my reason to visit when it was agreed I would do a feature on the place for this magazine. Right – the trick here was going to be in the planning. I knew I wanted to spend some time on nearby Walney, so I booked a Friday night stay there at the Castle House Hotel, and then made a reservation at Clarkes Hotel in Rampside for the Saturday. All that remained was to book my ferry trip over to Piel on the Saturday afternoon. “No problem,” assured the local ferryman, “just give me a call about half an hour before you want to go and I’ll meet you at the harbour!” Fabulous, I thought – we’re all sorted. Travelling from Fleetwood to Walney on the Friday night was an absolute delight – it was one of those sunny evenings (a bit of a rarity this summer, admittedly) and there was virtually no traffic (even more of a rarity), so the journey was a 90 minute breeze, door to door. After checking in to my hotel, it was an unexpected pleasure to just relax with a nice glass of red while basking in the warm glow of the Morecambe Bay sunset, looking forward to a weekend of adventure. Saturday morning arrived, and I was up and out early for a walk along the beach. This is such a hidden gem on the ‘Lancashire’ coastline (ok, so it might be Cumbria now, but it always was part of Lancashire before all those silly boundary changes of the 70s) and well worth investigation. Walney has a strange feeling to it really: you could almost be on a remote western isle off the north west coast of Scotland, and yet you’ve got busy and thriving Barrow-in-Furness just across the bridge. Follow the road around the west side, and you’ll eventually come to Biggar Village, and the incredible Queen’s Arms pub. It looks incredibly spooky – almost like it could be straight out of The Wicker Man – but serves a gradely pint which washed down one of the best homemade steak and kidney pies I’ve had in years. This claims to be Furness’ oldest inn, dating back to the fourteenth century. It doesn’t actually look as if it’s changed much since then, either, but it would be a sin if it did. The Queen’s Arms’ ancient charm makes it one of those places that just puts a quiet smile of amazement on your face. After lunch, with excitement mounting rapidly, I drove the six or so miles round to the Clarkes Hotel at Rampside. Piel Island was getting ever closer: time to ring the ferry man and summon him forth! I waited with bated breath as my mobile made the connection. “But I’m here now. I’ve paid a fortune for my hotel and I need to take some pictures and explore the island for a magazine article, and… and…” I was virtually hysterical and bordering on being unreasonable. “Sorry mate,” came the chirpy little retort from the other end. “Nothing I can do about it. We’ll be back up and running on Monday.” And with that, he rang off. Of course, he was absolutely right. No matter how unreasonable I wanted to be, there was simply nothing anyone could do, and it was nobody’s fault. This didn’t, however, assuage my bitter disappointment. I felt like the child with no Christmas presents; I couldn’t go to Piel Island and I was moribund. I trudged back into my hotel room, defeated. I had been thwarted and I needed consolation – maybe I could just park the car up and resort to more beer. It would help numb the pain of my aborted adventure. I had waited forever for this trip, and now I couldn’t go. I don’t usually sulk for long, and I can’t stand petulant behaviour in others, so always try not to indulge myself in it for more than a few minutes. I didn’t opt for drowning my sorrows in the end, but drove across the causeway to Roa Island so I could at least look longingly at Piel and maybe get some shots with my zoom. It was while standing there weighing up light and distance that I noticed a little yellow boat zipping back and forth around the jetty. Eventually, the little craft bobbed up and moored itself alongside me. It was piloted by young Carl Richards, a native of Walney, who was keen to show off his recently acquired vessel, the Ooloo. “I don’t suppose you’d take me across to Piel Island?” I asked, rather hesitantly. Why should he? He didn’t know me (I could be an axe murderer) and I didn’t know him (he could be an axe murderer). “I’ll give you twenty quid if you do,” I said anyway, obviously willing to risk anything in my desperation. After thinking about it for a few minutes, Carl decided he would take me across if I was prepared to share the trip with a few of his mates (they might all be axe murderers). I took a gamble on the likelihood of their murderous intent and, deciding that they probably didn’t have any other plans than a night’s camping, agreed to the proposal with the caveat that I only handed over the cash when he came back to pick me up (much as I relished the prospect of exploring my mysterious island, I didn’t want to be marooned there for the rest of my life). All points agreed, I was loaded onto the boat along with my fellow passengers and several cases of Stella Artois and within minutes we were bound for Piel Island at last. Ten minutes later, I was disembarking on the island’s shores, ready – at last – for my adventure. Carl zipped off into the distance and I staved off the vague notion that I might be left stranded after all, reflecting on what a sad state of affairs it was that we all seem to operate in an environment with such a lack of trust these days. A sign of the times, I guess. Piel was not disappointing. The day was perfect, and as I ambled around the island and its incredible ruined castle, I yearned for more knowledge of its history. My research had already told me that this 20 acre island has been designated a ‘Site of Special Scientific Interest’ (SSSI) and is owned by the people of Barrow, having been gifted to them by the Duke of Buccleuch in 1920 as a war memorial. It is managed by the ‘king of Piel’ – a title given to the landlord of the Ship Inn public house, the island’s only watering hole, although the pub has been without a landlord since Rod Scarr, the last incumbent, sadly ‘abdicated his throne’ at Easter 2006 after a 20 year reign. Rod and his family have now retired to the ‘mainland’ of Walney Island. The Inn is in need of vital renovations, and I understand the local council were supposed to start work in late 2006 to restore and make the premises habitable. This work has still not been started, but the council now appointed a new ‘king’, Steve Chattaway. Planned refurbishment has not yet taken place, so it remains to be seen when the official ‘coronation’ will occur. Along with the pub, the island’s only other buildings are a block of six privately owned cottages, a public toilet and shower facility (the island is a favourite destination for campers) and, of course, the magnificent ruins of the 14th century castle. 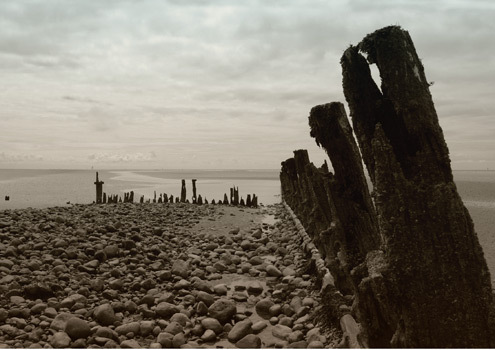 The Furness area has always had a chequered history in spite of its relative remoteness. Piel was also known under its Scandinavian name of Foundry Island (or Fotheray Island – the name possibly originating from the old Norse ‘foder’ or ‘fouder’, meaning fodder and ‘ay’ or ‘oy’, meaning island, so literally a foddering place for early settlers to graze their animals). Along with its castle, it has been witness to some of the greatest events in history. Piel was probably visited by the Celts, and later the Romans, during their conquest of Britain. In 1127 the island was given to the Savignac monks as part of their original land grant for an abbey from King Stephen. After the Savignacs merged with the Cistercians in the middle of the century, Furness Abbey started to grow and the need for a safe harbour was felt. Foundry seemed to be the ideal answer as it was protected, was close to the Abbey and there was land to build a warehouse in order to keep cargoes safe. There is no mains supply of gas or electricity to Piel, so life can become more than a little harsh for those who wish to stick it out over the winter. It’s not all hardship though, as fresh water is piped from the mainland and there are flushing toilets! Communication is by ship to shore radio and, in more recent times, mobile phone. Supplies are brought across by ferry from Roa, but residents usually get their own provisions either by private boat or across the sands by tractor to the mainland at low tide. During the summer months, the clear waters and exposed sandbanks around Piel attract numbers of shore birds and in recent years seals have occasionally been sighted. The original marsh pond in the centre of the island has, with careful management, become a haven for many other types of birds and wildlife. Information boards at regular intervals provide both historical and environmental facts, which helps to give you a feel for this rich and wonderful place. An unexpected haven of peace, Piel Island is the perfect escape if you need to be far from the madding crowd for a few hours. I would have loved to have stayed for longer myself, but Carl had sent one of his scouts, young Danny McMullan, out to find me – he was anxious to get me back to the mainland and go home for his tea. It had been every bit the adventure I had hoped, and Carl had played a vital part in making it happen. Without his trust and assistance, I may still not have explored the delights of Piel Island, so I thank him unreservedly for being my personal ferryman. And I urge anyone with a sense of adventure to explore this magical place for themselves. email pielisland@tiscali.co.uk or Alan Cleasby on 07798 794550. A local guiding company, Murphy’s Miles is happy to take groups across the sands at low tide to the island. Contact John Murphy on 01229 473746 or email murphysmiles@hotmail.co.uk. A lovely piece of wrting about a great little place. I love Piel and especially the amble across the sands. Intriguing ! I would love to visit these islands, definately on my to do list in the near future.